Storyline 3 uses a hierarchical structure of scenes, slides, and layers to organize content. Scenes are the largest organizational units. Each scene contains one or more slides. And each slide can have multiple layers. 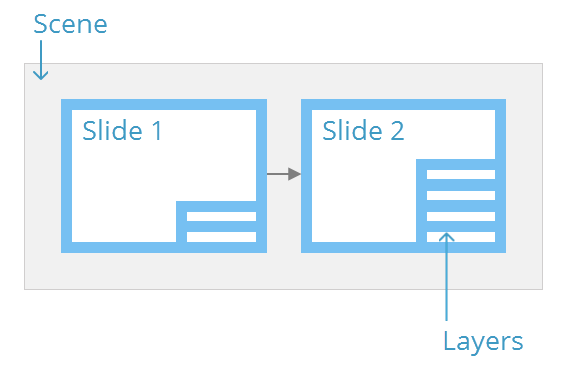 In Story View, lines and arrows indicate the relationship between slides and scenes. Use triggers to customize navigation and create branched scenarios. See the section on changing the navigation order later in this tutorial for details. A question draw is a special slide in your course that pulls questions from a bank when the learner reaches the slide. A question draw can be a subset of questions from a bank or an entire bank, and it can even be randomized.